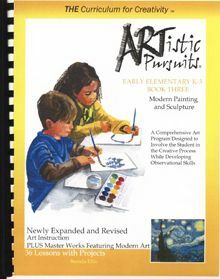 Our family has had the privilege of reviewing ARTistic Pursuits Early Elementary Grades K-3, Book Three: Modern Painting and Sculpture for use with children in kindergarten through third grade. The newly revised third editions "offer more pages on art techniques, more lessons and guide children through processes that expand their abilities when using art materials." In each of the three, K-3 comb bound books, there are thirty-six projects that combine art techniques AND art history. In K-3, Book 3 there are 92 pages and 216 illustrations! Now, we didn't begin with K-3, Book 1, An Introduction to the Visual Arts. According to the author, it's not imperative that you go in order but keep in mind Book 1 has projects that are simpler than Book 2 and Book 2 simpler than Book 3. Additionally, the K-3 books are arranged according to time: Book 1, An Introduction to the Visual Arts (Ancient - 1300's ), Book 2, Stories of Artists and Their Art (1200's - 1800's ) and Book 3, Modern Painting and Sculpture (1850's - today ). The skills learned in each book are separate and not necessary to perfect before going to another book. Therefore, each book can stand alone. We choose K-3, Book 3 first because a couple of years ago, we attended a Monet and Impressionist Art exhibit at the High Museum of Art. That day has stuck with us, so that is the main reason why we chose to begin our studies with K-3, Book 3. If you are studying history chronologically, you might enjoy beginning with K-3, Book 1 to go along with your early history studies and so on, too. ARTistic Pursuits way of teaching art is different from the art lessons we have taken in the past. ARTistic Pursuits doesn't teach how to copy someone else's art. They teach different art techniques and have the student practice a particular technique on their own, unique drawing or sculpture. The lessons are written to the student. No teacher prep involved. As long as you have the needed art supplies, just open the book and go! What is the purpose of K-3 Book 3, Modern Painting and Sculpture? The goal of Book 3 is to show "students how to view abstract works by examining the elements of line, space and color. It emphasizes how realistic works tell a story that people can understand. Students will see how new ideas in painting carried over to works of sculpture." We (all three children, late pre-k to third grade participated) typically begin by learning about an artist and what was going on in the time and area in which they lived. One or more of their art pieces are showcased, picture(s) included! There are specific questions posed for the student about the particular art piece pictured. Along with the art history, I also appreciate the art appreciation aspect of the program, too. I don't always pick up on the subtleties of art. It's nice to have what should be pointed out, pointed out! Occasionally, there are red rectangle boxes at the bottom of a lesson page. Inside the rectangle is a library book or video suggestion. We haven't had much luck with finding the specific titles recommended in the book, but we have had success finding excellent alternate titles and videos at our library. Next, we work on a project. I've included all three of our kids in each lesson thus far. We've learned the differences in Renaissance and Impressionist art. We've learned about gouache paint and gouache paint techniques- such as how and when to use a flat brush and round brush. We've looked closely at many master artist's paintings and answered questions about each. We've learned how to create a color wheel and how to mix colors together and so much more in just six lessons! My six year old's back of the menu drawing! Art is on our minds! While out to eat, I've found ALL of my children drawing and coloring pictures on the back of the children's menus. My six year old hasn't been a big drawer, that is until we began this program! 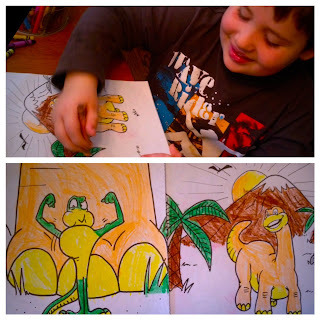 His drawings for math, and his coloring in general has really impressed me over the past few weeks! My oldest has held her own painting class for her younger brothers - because she and they wanted to! Our oldest asked to attend a watercolor workshop at a local art gallery, too. So, art has certainly been on everyone's mind since beginning this program! In our experience, two hour art workshops cost about twenty dollars. So, this very teachable curriculum (especially, for the teacher with very little previous art experience like me) is a very good investment. I am so impressed with the way my six year old used two colors for his dinosaurs and the sun! Love to see childre's worlds opened up to new ideas and talents that they might have. Great review, from a fellow Crew member.